Tubeless tires can be a technician’s nightmare, but not if you supply the necessary tools. Tire spreaders are typically used to inspect and repair tires, allowing you to pull apart the beads of a tire to expose the inside cavity. These tools are invaluable to dealerships, fleet maintenance centers, tire shops, and other automotive businesses. Our selection includes top-of-the-line spreaders made by ESCO, Nationwide, and other trusted brands. We also offer free shipping on select products, as well as interest-free financing for up to six months on deluxe models. Shop from our selection today to find the perfect solution for your business. We carry both manual and air-operated tire spreaders to suit any need or application. Portable units are particularly useful to businesses that might like to employ repair and inspection stations throughout the service bay. 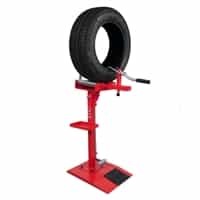 Tire service centers enjoy the convenience of height and width adjustments, and many of the models in our selection come with utility trays to hold breakers, bead seaters, lug wrenches, patches, tools, and more. We offer manual spreaders with tilting pedals to make service work efficient and simple. Rotatable designs allow for better positioning. Some portable units are small enough that they can be mounted on workbenches or any solid surface. Pneumatic tire spreaders might be more expensive, but they are very easy to use. Most of the air-powered spreaders we sell are designed for the repair or passenger and light truck tires. Handheld pneumatic spreaders come with hand and extension levers, as well as a portable design that can be used with only one hand. Save time and energy with a tire spreader to aid in better visualization for proper inspections or internal repair. If you repair passenger and light truck tires on a routine basis, Best Buy Auto Equipment can help. Our selection of tire spreaders includes a solution at every price point, so you’re guaranteed to find a device to suit your budget. We can also provide assistance by helping you choose the right products for your business. While you shop, don’t forget to register your account and sign up for our newsletter! If you have any questions about our product selection, please contact us today for additional information or further assistance.